1691 ~ 1713: born in Edo. He starts his career as a disciple of Ichikawa Danjûrô II, playing under the name of Ichikawa Chônosuke. He takes later the name of Ichikawa Benjirô at an unknown date. 11th lunar month of 1713: Ichikawa Benjirô takes the name of Ichikawa Monnosuke I by playing a wakashugata role at the Moritaza in the play "Yorimasa Daikyoku no Mato". 11th lunar month of 1714: Monnosuke plays at the Moritaza the role of Shinra Saburô in the kaomise drama "Onna Ryûko Futatsu Gashira". 11th lunar month of 1715: Monnosuke plays at the Moritaza the role of Chikaranosuke in Mitsushima Shichirôzaemon's drama "Hayazaki Onna Shimabara". 2nd lunar month of 1716: Monnosuke achieves a great success by performing in the same theater the role in the drama "Rakuyô Aigo no Waka". 11th lunar month of 1717: Monnosuke plays at the Moritaza the role of Ôtô-no-Miya in the kaomise drama "Hônô Taiheiki"; his stage partners are Ichikawa Danjûrô II, Hayakawa Dengorô, Ôtani Hiroemon I, Ogawa Zengorô I and Asao Jûjirô. 9th lunar month of 1718: Monnosuke plays in the same theater the role of Onatsu in the drama "Shikirei Imagawajô". The role of Seijûrô is played by Ichikawa Danjûrô II. 11th lunar month of 1718: Monnosuke performs in the same theater in the kaomise program "Zenkunen Yoroi Kurabe". His stage partners are Matsumoto Kôshirô, Sawamura Sôjûrô, Ôtani Hiroemon I, Mizuki Takejûrô, Tomizawa Hanzaburô I, Tamazawa Rin'ya and Asao Jûjirô. 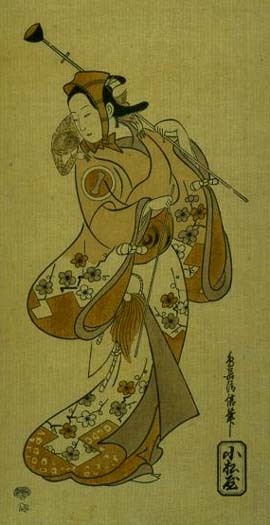 1st lunar month of 1721: Monnosuke plays in the same theater the role of the courtesan Ôiso no Tora in the new year sogamono "Nigiwai Suehiro Soga". His stage partner in the role of Soga Jûrô Sukenari, Tora's lover, is Mimasuya Sukejûrô I. 11th lunar month of 1721: Monnosuke plays in the same theater the role of Semimaru in the kaomise program "Semimaru Yôrô no Taki". 1st lunar month of 1722: Monnosuke's rank in the Edo hyôbanki, wakashugata section, is jô-jô-kichi (superior - superior - excellent). 11th lunar month of 1722: Monnosuke moves to the Nakamuraza and plays the role of Kusunoki Masatsura in the kaomise program "Hônen Taiheiki". His stage partners are Ichikawa Danjûrô II (Nitta Yoshisada), Ôtani Hiroji I (Nagasaki Kageyu Saemon), Mimasuya Sukejûrô (Shinozuka Iga-no-Kami) and Tsuruya Nanboku I (Hata Rokurô Saemon). 1st lunar month of 1723: Monnosuke plays in the same theater the role of Kyô no Jirô in the new year sogamono "Soga Koyomi Biraki". 11th lunar month of 1723: Monnosuke plays in the same theater the role of Hôjô Tokimune in the kaomise program "Sono Enpô Onna Migyôsho", which celebrates the arrival at the Nakamuraza of the Kamigata actors Yamashita Kinsaku I and Sanogawa Senzô. 1st lunar month of 1724: Monnosuke plays in the same theater the role of the flowers seller Mikinosuke in the new year program "Matsu Kazari Kamakura Biraki". 3rd lunar month of 1724: Monnosuke plays in the same theater the role of Matsuwakamaru in the drama "Irifune Sumidagawa". 11th lunar month of 1724: Monnosuke plays at the Nakamuraza the role of Ashikaga Yoshimasa in the kaomise drama "Taiheiki Okuni Kabuki". 1st lunar month of 1725: Monnosuke performs in the same theater in the new year program "Funadama Izu Nikki". 11th lunar month of 1725: Monnosuke plays in the same theater the role of Oniji in the kaomise program "Oguri Chôseiden". 1st lunar month of 1726: Monnosuke plays in the same theater the role of Minamoto no Raikô in the new year program "Kadomatsu Shitennô", which commemorates the 22nd anniversary of the death of Ichikawa Danjûrô I. 11th lunar month of 1726: Monnosuke plays in the same theater the role of Minamoto no Yoshiie in the kaomise program "Kaomise Jûnidan". His stage partner in the role of Wada Saemon is Matsumoto Kôshirô I. 1st lunar month of 1727: Monnosuke performs in the same theater in the new year sogamono "Yuzuri Gongen Soga". 11th lunar month of 1727: Monnosuke moves to the Moritaza and plays one more time the role of Kusunoki Masatsura in the kaomise program "Hônen Taiheiki". His stage partners are Ichikawa Danzô I (Hata Rokurô Saemon), Tomizawa Hanzaburô I (Moronô), Sakata Hangorô I (Nagasaki Kageyu Saemon), Tamazawa Kôjûrô (Nitta Yoshisada), Fujimura Handayû II (Kusunoki Kikusui), Sodesaki Miwano I (Manjû no Mae), Tsuruya Nanboku I (Shinozuka Iga-no-Kami) and Yamamoto Hanasato (Kôtô-no-Naishi). This performance also celebrates the shûmei of the actor Tamazawa Kôjûrô. 1st lunar month of 1728: Monnosuke is supposed to play in the same theater in the new year program "Hatsu Midori Aioi Soga" but, because of health problem (? ), he has to stop acting and rest for a while. 11th lunar month of 1728: Monnosuke is back on stage, at the Nakamuraza, playing the role of Ema no Koshirô in the kaomise program "Hoshi Kabuto Goban Tadanobu". 1st lunar month of 1729: Monnosuke dies in Edo. His tombstone is located in the Honseiji temple in the district of Fukagawa. Ichikawa Monnosuke I was a wakashugata actor reputed for his beauty and his powerful voice. He was referred in the Kabuki chronicles as "wakashugata no Kaisan" ("the founder of the young boys roles") or "wakashugata no Meijin" ("the master/expert of the young boys roles").